I read a tweet today complaining there isn't any good Bible software for Windows Phone 7 yet, and the (admittedly bizarre) first thought that came to my mind was "I guess you'll just have to switch to a supported religion..."
I guess that above is what, in the publishing biz, we call a "hook," but I'm new to all this, and I admit a little bit giddy about it in a hero-worship sort of way. I'm honored to have been asked by Jason Dunn to write the occasional musing here at Windows Phone Thoughts. I'm currently a Microsoft Windows Phone MVP, and I've been using Windows-based handhelds since the turn of the century (I love using that phrase- it makes me sound like my grandfather.) I go back to the ancient days of non-wireless PDAs that we'd sync to our PCs once or twice a day, and browse offline web pages copied from our PCs with software called AvantGo, a sort of precursor to the modern RSS feed. One of those "channels" AvantGo offered, was a technology news site called "Pocket PC Thoughts" and I was sure to read it every day to keep up with the goings-on in the wonderful world of Windows-based handhelds, and I've followed it ever since. Being asked to contribute to it after reading it for all these years is sort of like going to a Who concert and having Pete Townshend grab you and ask if you'd like to sit in and jam on a song or two. (I'm showing my age now, aren't I?). But I digress - there actually was a point to that opening paragraph, and how it applies to me personally (that, dear readers, is what we call a segue, and, in this case, a pretty darn clumsy one!). Obviously the idea of changing religions for a phone was silly, but it made me think about "ecosystems" and how far we modify our work and even life patterns to fit the technology we use. I often joke I came into Windows-based mobile devices backwards. Microsoft originally envisioned these devices as peripherals for your PC that would allow you to take your Outlook data and Office documents with you wherever you go. When I bought my first device, a Casio Palm-sized PC, I had never used Outlook; the "Outlook Express" client bundled with Windows was good enough, and Microsoft Works did everything I needed, so a $500 Office Suite seemed extravagant and unnecessary. I was just after a mobile computer - something far smaller than a laptop, with better battery life, and that took up very little room in my bag when traveling either on business or pleasure, and Pocket PCs were just that: PCs that fit in your pocket! Well, a big pocket anyway... those Casios were pretty brick-ish! Only after I wanted to expand the functionality of my little gem did I switch to Outlook, and eventually moved to Office. I didn't get my PDA to view my desktop's data while on the go, I'd made my PC compatible with my PDA! The cart, as they say, was driving the horse! After that, everything computer-related in my life had to be compatible with my mobile devices or I wasn't interested. Desktop map software? Had to be Streets and Trips - most of the competitors would export maps to Palm, but not Pocket PCs. Yes kids, before Google Maps and Bing we actually had to install map software on our computers. And we walked six miles to school in the snow, too. When I needed to replace a dying all-in-one printer, I bought one with WiFi. I didn't need WiFi on a printer for any reason other than it allowed me to print to it directly from my Windows Mobile phones. I've thrown away wireless routers that my mobile devices couldn't connect to consistently, bought mobile infrared and Bluetooth printers with Windows Mobile compatibility, and special-ordered cradles and cables that would let me interface my PDAs with analog cell phones (ahh, 2400 baud...) If it wasn't compatible, I'd find something else that was. Come to think of it, maybe I actually would choose a religion solely based on its compatibility with my smartphone. Anyone know if there's a good Quran or Tibetian Book of the Dead in the Marketplace? Welcome to the team Todd! 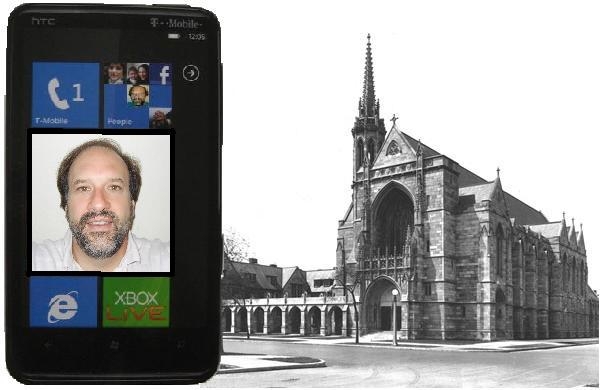 Todd, while we are on the subject of bible software, check out my first App for the Windows Phone. Nothing fancy, just a simple schedule for regular Bible reading called called Sequential Bible Reading. Todd, it's good to have you here. I was thinking that there are several semi-decent apps, but without Laridian and similar, it's been pretty quiet on that scene. YouVersion is nice, but really not up to the task just yet. That aside, your comments remind me a lot of Linux users. Printer doesn't work with Linux? Get a different printer. Ditto for webcams, modems, scanners, and so on. There's nothing wrong with wanting hardware that works well with your platform. I remember Streets & Trips - exported a map of the DFW area and exported one for the whole state of CT - they were the same size. Then we got useful navigation tools and more native apps so I just switched over to those. Bing Maps works pretty well for WP7 and haven't had a huge reason to complain. I haven't really used any Turn-By-Turn navigation apps in the past, but may when Mango comes out. I'm generally okay without them. While not likely to switch religions based on what's available, from the little I've seen there hasn't been a lot that's notable in the faith/spirituality department on WP7. As noted, YouVersion works pretty well. There are several Bible translations that are stand-alone and not too bad. I've seen some apps oriented towards Islam, Judaism, Buddhism, Hinduism, Astrology (not sure of the classification there), but nothing really struck me as hugely innovative. I keep looking for YouVersion to improve and hoping for Laridian to port their product as they were great for WM, but YouVersion isn't quite there yet and Laridian hasn't announced any plans. I definitely remember the older days, but already used Outlook so that wasn't a huge transition. I never got the hang of AvantGo. Definitely didn't do web-browsing for ages because either the device didn't have any networking or when it did, the browser was so horrible that browsing was pointless. Even running my 8125 got pretty slow after a while. While there are some things I miss about those days, I'm glad MS ditched WM stuff and moved towards WP. There is some other Bible based literature at www.jw.org Audio, PDF and Epub. It is a Window Phone 7 app. It includes the Bible (KJV) and so much more. OMG Todd! Pardon the pun but as I read through your post, I thought you were talking about me. Aside from the fact that I started out on a Rolodex handheld purchased from Radio Shack and then took a BIG technological jump to a Sharp IQ-8500M (which I still have by the way), the parallels are uncanny. Regardless of the type of hardware or software, I was always driven by being mobile and having accessibility. Heck, I even purchased a GSM Cellular SD Card to use with my old Dell Axim. Looking back it took almost 5 minutes to install the SD card and actually make a phone call but I was connected. Welcome to the club Grampa! Thanks, old-timer. I, too, go back to ancient "pre-PDAs" like a 64k Casio handheld address book/calendar and my pride and joy, and a mid-1980's Radio Shack handheld "PC-3" ("PC" stood for "Pocket Computer," not "Personal Computer) that you programmed yourself in "Pocket BASIC," at least whatever "programming" you could fit into the 2KB memory! I even had the matching Printer/Cassette interface that let you save your masterpieces on tiny grocery store receipt-sized roll thermal paper or cassette tape. Hopefully I won't bore the youngins here with too many tales of the late Cretaceous computing era, but much of what I write will likely be colored at least a little by the lenses of historical perspective. I hope you'll enjoy it. Hey, I remember that PC-3! Although the "programming" part scared the heck out of me so I opted to go with my first PC (Personal Computer), a Tandy model without a hard drive and only 2 x 5 1/4" floppies to run with. Oh, those were the days. Well, I for one will enjoy your fresh perspective Todd. A perspective molded from the dawn of portable computing time (as oppsd 2 th txtg genn).